Heartless by Anne Elisabeth Stengl . I LOVE the cover for this and it sounds ace!. Iron Daughter by Julie Kagawa. Great books! I can't wait to read Crescendo. Hope you enjoy them all. The Iron Daughter is !!!!!. Hope you love it as much as I did. And wasn;t Crescendo such a great surprise? I'm loving the illustrations in Scarlett Dedd too! Yay for Crescendo ... hope you enjoy! What you got Crescendo?! I guess that means mine is on its way to my front porch this week then.. it looks so beautiful I can't wait to read it. I hope you enjoy it! Yay for Crescendo! Is that just the most exciting arrival or what?! Reeeally want to know what you think of Heartless! 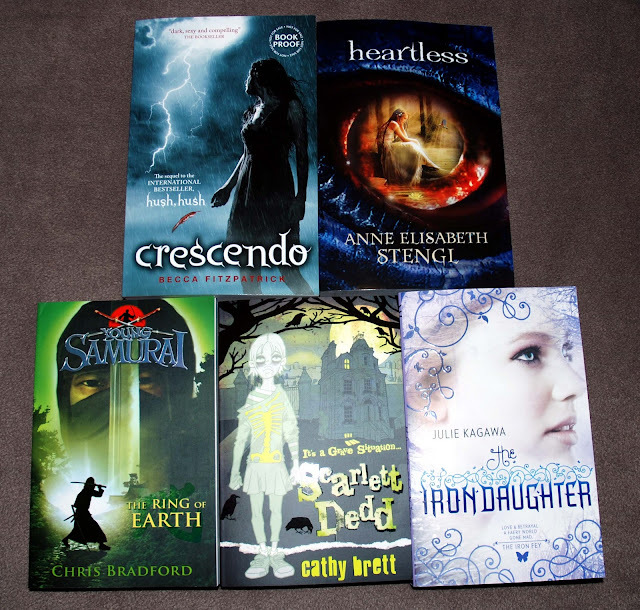 Crescendo and Scarlett Dedd look great, enjoy! Wow, the cover of Heartless *is* amazing. Can't wait to see what you think of that one. And, of course, enjoy Crescendo! Nice set of books! Ohh I never heard of Heartless and it does sound good! WOW! You got some amazing books! :) Congrats! Isn't it crazily exciting to have Crescendo. Enjoy! What a great week! I just won the Iron Daughter, so I'm looking forward to your review!